There are two cruciate ligaments in the knee joint, the cranial (or anterior) cruciate ligament and the caudal (or posterior) cruciate ligament. The cranial cruciate ligament is very commonly injured in dogs and this causes instability of the knee and may lead to other problems such as meniscal (cartilage) injury and osteoarthritis. 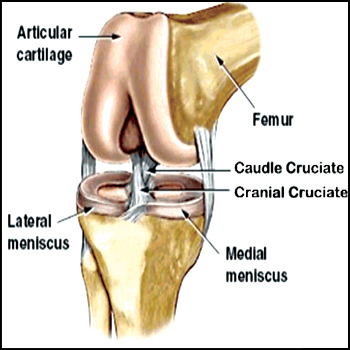 It is rare for the caudal cruciate ligament to be injured. What sorts of dogs are affected? The cruciate ligament seems to weaken gradually in dogs, particularly in some larger breeds, and this means that the cruciate ligament may eventually rupture even during normal activity. Some large breed dogs can suffer cruciate ligament rupture from quite an early age (1-3 years) and often in both knees. However, many dog breeds can suffer from cruciate ligament rupture. There is a suggestion that obesity also increases the risk of cruciate ligament rupture. Rupture of the cruciate ligament may occur suddenly or gradually and this can be reflected in the appearance of the signs of the condition which include lameness and stiffness of the knee. Full rupture of the cruciate ligament causes instability of the knee and this may lead to joint swelling and wasting (atrophy) of the muscles of the hind limb, particularly the quadriceps muscle group. Dogs with cruciate ligament rupture often prefer to sit with the affected limb straightened out in front of them rather than tucked up; this is because they do not like to flex the knee. A clinical examination by a veterinary surgeon is the first step in diagnosis. If cruciate ligament rupture is suspected, further tests may be required, including x-rays, or exploratory surgery. Once the cruciate ligament is ruptured, about 40-60% of knees will also develop injury to one of the cartilages of the knee. Osteoarthritis will develop in all knees with cruciate rupture, but may not cause problems for many months or years. What can be done to treat the condition? If causing persistent problems, and especially in larger dogs, the condition is best treated with surgery to stabilise the knee. In the long run, all joints with cruciate ligament rupture will develop some degree of osteoarthritis. However, for most dogs the response to surgery is good and the osteoarthritis does not seem to cause problems for several years. The success of surgery depends on early intervention. An unstable joint result’s in the joint being irreparably damaged and response to surgery is marginal. If you suspect a ruptured cruciate have it dealt with as soon as possible to avoid progressive joint destruction.